We have to start somewhere so let’s look at the basics of configuring OSPF. 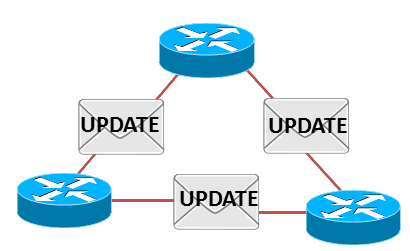 Remember OSPF is an IGP (Interior Gateway Protocol) and allows packet authentication as well as IP multicast when sending and receiving updates. In this post we are configuring OSPF in a single area. In this topology we have four routers and two PCs. The PCs subnet are 172.30.2.0/24 and 172.30.3.0/24. We have point to point connections between each router. So we have already configured all of interfaces and everything seems good but PC1 can’t ping PC2 and vice versa. If we do a show ip route on R1 we can see that R1 does not know about the 172.30.2.x or 172.30.3.x network as well as any other network not directly connected to R1. We also see the same issue with R3, if a routing protocol is not configured on router it will only know about its own active networks. To configure OSPF you can do this in two ways. Let’s look at the traditional way to configure OSPF by jumping into to R1 and in the configuration mode let’s enter router ospf 1 followed by enter. (NOTE: 1 is the process ID for OSPF you if you don’t what to use 1 we can pick between 1-65535, also this does not have match on each router). So what just happened? Well nothing yet because R1 is this only router sending OSPF updates so let’s jump to R2 and run the following under the config-router prompt. Notice the OSPF Adjacency that came up, this is good news because we now have OSPF running between R1 and R2 and they are exchanging updates between each other. We can verify this up looking at show ip ospf neighbor. Let’s get PC 2’s network advertised as well as all of the remaining interfaces on R1 and R2. Looking at the routing table in R1 we can see the 172.30.2.0/24 is reachable by leaving R1’s gigabitEthernet0/1 interface. So depending if you have a newer IOS software there is another way to configure OSPF instead of using the network command while in the (config-router) prompt. This newer method is configured by going under the interface of which you want OSPF to run. Let’s configure it on R3 and R4. We still have to switch on OSPF by running the router ospf 1 command but then we can go to the interfaces. Now let’s go to gigabitethernet0/1 on R4 and tell OSPF this is the interface we want OSPF running on. Also notice the adjacency with R2 this is good news. Let’s continue this on all remaining interfaces on R4 and R3. We now have OSPF setup. We can verify this by typing show ip ospf neighbor. Let’s look at the routing table of R3, do we have route to 172.30.2.0/24 network? It looks like we do but why do we see only one route? Remember that OSPF will choose the best path and put that path in the routing table. Going straight to R2 instead of going through R1 or R4. However OSPF knows about the other two routes which is why it is able to converge quickly. That’s an important tip when comparing distance vector protocols vs link state protocols. In link state protocols routers know about the entire topology within an area and each router determines the shortest path to available destinations. So in case of a failure of the link the router would already know what path to take so there is no need to re-converge the routing table. Take a look at the routing table of R3 again after I disabled interface Gig0/3 on R2. We can now see two routes to the 172.30.2.0 network. Since these paths are equal OSPF will balance between R1 and R4 to get the 172.30.2.0 network. This stays this way until the link between R2 and R3 comes back online. I’ll end it here because that’s all I got for this post like always I hope this information is helpful in understanding the basics of OSPF with in a single area configuration.